click image for close-up In compliance with the recently enacted Fugitive Slave Act, Anthony Burns was ordered by the court on June 2, 1854 to be returned to slavery in Virginia. 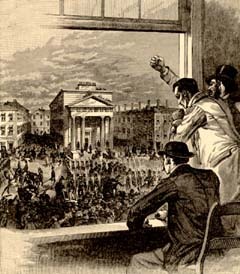 An estimated 50,000 outraged citizens lined the streets of Boston as an army of soldiers escorted Burns to the waterfront. This engraving depicts the scene of Burns' march. Men in a window, along with the angry mob outside and on top of the surrounding buildings, shout out "Kidnappers!"